We all knew that Stephen Strasburg and Wilson Ramos were set to be free agents after this season, and much to the surprise of Nats’ fans, Strasburg signed a mega-extension leaving Ramos as the lone starter for the Nationals this season going to free agency. Wilson Ramos this season became an All-Star and has spoken of his impending free agency, and how he had not received any offers from the Nationals. In fact, Ramos spoke last week how the pressure of free agency got to him. Ramos last year switched agencies from Relativity Baseball to Octagon Baseball. We were told by one of our sources that the discussion with Ramos’ representatives at Octagon was closer to 3 years at $35 million, and that is more per year than the 5 year/$52.5 million deal that goes into effect for Salvador Perez next year in his age 27 season. Perez is a four-time All-Star and two-time Gold Glove winner and a World Series MVP. However, just because Perez signed such a team friendly deal doesn’t mean Ramos will or will not. The big difference is Ramos will be thirty-years-old next year and has not been durable over his career as he has suffered through many injuries, and only has this stellar 2016 season to bolster his free agency bid for his big payday. Catchers, and especially big body catchers, do not always age well past their age-32 seasons because of all the wear and tear. Time will tell on this as Ramos enters an off-season that is lackluster on free agents if Yoenis Cespedes stays with the New York Mets which will boost up Ramos’ value as it is the simple economics of supply/demand. Today, Ramos is projected as the #4 free agent in the Majors, and that will mean a big payday regardless of whether he signs beforehand with the Nationals. There are always limits and budgets and salary caps and then there is reality. 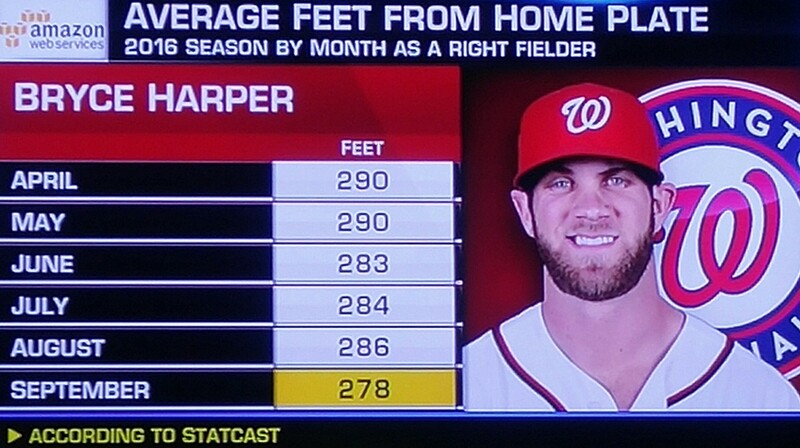 The talk this week once again is on the health and well-being of Bryce Harper, and any talk of $400 million or $500 million extensions looks to be in the rear-view mirror at this point and Nats fans are just concentrating on whether Bryce’s issues are a balanced swing as Dusty Baker said or is he hurt? Mike Rizzo said it over and over again that Tom Verducci’s report was inaccurate on Bryce’s health. Bryce still has time to finish his 2016 season strong, but don’t expect Bryce to sign and extension in the off-season after a down-season. Bryce Harper is still under team-control for the 2017 and 2018 season and he will want to raise his stock back up! 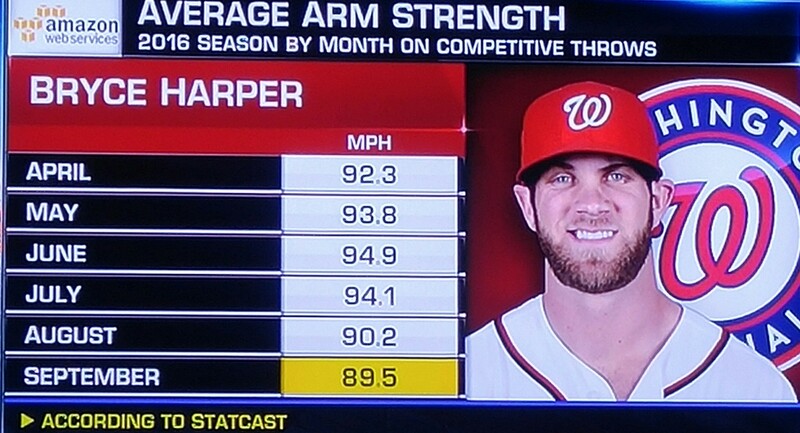 Two charts that factually support something is going on with Bryce Harper shows his arm strength and his positioning this season. The Nationals will have moves to make this off-season, and quite possibly before this season is completed the Buffalo will be a Nat for several more years. This entry was posted in Analysis, Harper, Ramos, Strasburg. Bookmark the permalink.